My 9 year old son Lee sometimes asks me "Mommy, how do you come up with all your recipe ideas?" and I tell him, more often than not I get inspired by recipes I see on the net or elsewhere. I don't usually make recipes as I find them, because of food sensitivities and monetary constraints. Some recipes I am especially proud of, as I figured them out from start to finish, not basing them off any or even multiple other recipes, but entirely out of my head. My vegan, flax seed based mayonnaise is one of those recipes that I figured out entirely on my own, and it is really an amazing one, with the exact texture and taste of egg based mayonnaise (unlike most vegan mayonnaise recipes whose texture leaves much to be desired). 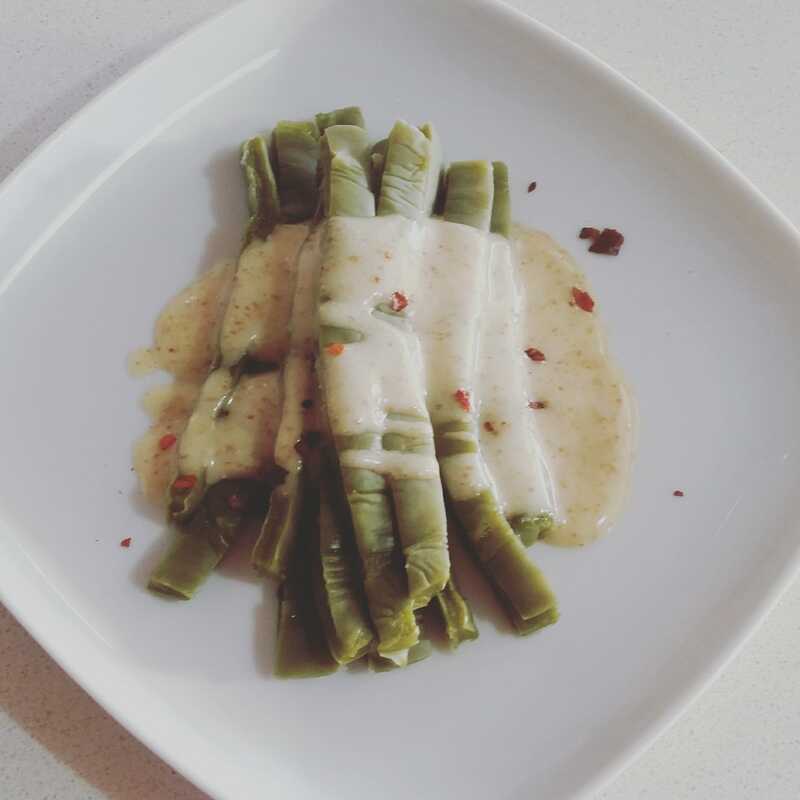 When I was lucky enough to be able to forage a bunch of asparagus (something I rarely eat, as they are ridiculously overpriced here, and wild ones don't grow so frequently where I live), I wanted to serve them in the most delicious way possible, that would let their flavor shine (and not be hidden in a quiche or soup) while adding something to bring its flavor up a notch. Cliched though it is, I decided to serve my asparagus with hollandaise sauce. Or my version of it anyhow. I'm not a vegan by a long shot, but unfortunately I've got a sensitivity to most dairy and eggs. I've tried my way around it, tried duck eggs instead of chicken eggs, but I can't eat them either. And even ghee, which is clarified butter, with the milk protein removed, something many dairy intollerant people are able to have, makes me react, unfortunately. So the classic hollandaise sauce, made from egg yolks and butter is out for me. But that didn't mean I wanted to give up on it. 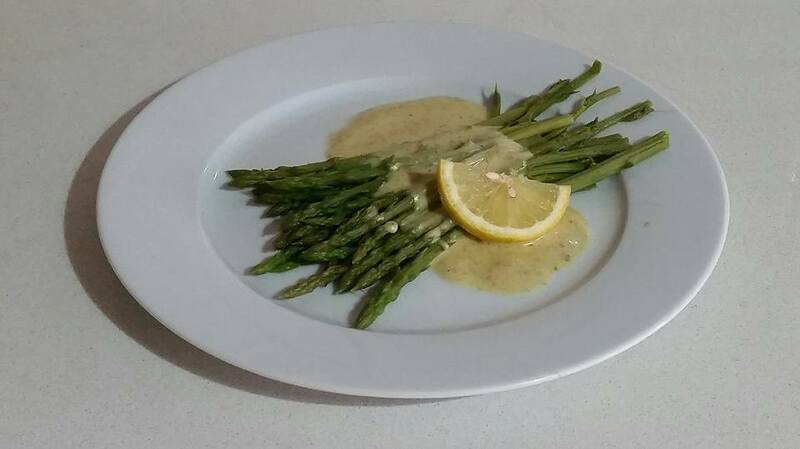 I did a bunch of research on making a vegan hollandaise sauce, and a lot of them had good ideas but usually they included ingredients I didn't want to use, generally artificial ingredients or soy based ingredients, not something I want to be using on my whole foods diet. Or their ingredients were expensive, or things I didn't usually keep stock in my home. But I did get inspired to use nutritional yeast to add the richness/depth of flavor that egg yolks usually add, and a drop of turmeric to make it more yellowish. I had in my house a non dairy "all natural butter flavor" extract, and I added some of that too, which made it even better. (I've been doing some research about how this "all natural" butter flavored extract is made without any dairy, and to be honest, I'm not 100% sure it's the best/healthiest ingredient to use. The main warnings about its health seem to be with breathing in large doses of the fumes... but I think, based on my research, that in minimal amounts I'm ok with it.) But I tasted mine at every stage, and even without these three things, it still tastes great, so feel free to leave any or all of those out if you would like to. As for the base of the hollandaise? When you have something perfect, why mess with it? My vegan flax seed based mayo works for mayonnaise, and essentially hollandaise is a runnier, lemonier, richer version of mayonnaise, so I decided to use my vegan mayo base and go from there. I've since fallen in love with this hollandaise sauce and and use it on nearly everything. It can be used as a topping for so many different foods- my favorites has been as a dipping sauce for artichoke, as a topping for stuffed artichoke, on steamed, sauted, or baked zucchini, on green beans, on cactus paddle spears, on potatoes, etc... You can use it on a vegan "eggs" benedict or "eggs florentine" which uses tofu instead of eggs (I don't eat tofu, so I won't be doing that). I've even seen meatballs served in hollandaise, which is on my to do list. I can't recommend this recipe enough. It keeps nicely in the fridge after making it, but I don't recommend heating it up on the stove or in a double boiler once made. I warm up mine for repeated use by putting the bottle or jar that holds the sauce in a larger container filled with boiling water. It doesn't get hot, but reaches a pleasant warmth that way. If I don't want to go to the trouble of making hollandaise from scratch and I have some ready made flax mayonnaise in my house, I sometimes make an improvised version of this hollandaise using that mayonnaise as the base, adding turmeric, lemon, nutritional yeast and butter extract to it and get something that is close enough and still delicious. Is this an authentic hollandaise recipe? Of course not. Without eggs and butter it's not authentic by a long shot. But it is an absolutely wonderful substitute for those like myself who either can't or won't use eggs and/or dairy. 1. Mix the ground flax seeds with the cold water in a saucepan, and heat it up on the stove, mixing frequently, until it is thick. Let it cool down to room temperature. 2. Add the flax seed mixture to a food processor or blender (a whisk would probably also work with this, but it makes a lot more work) and add in the smaller amount of nutritional yeast and salt, and dijon mustard. Mix it well. 3. While the food processor/blender is running, slowly drizzle in the oil, until it emulsifies and looks mayonnaise-like. If you add the oil too fast it will not get the proper texture. 4. Add the lemon juice and boiling water and blend/mix well. 5. Add the turmeric, butter extract, and black pepper if desired, then add more nutritional yeast and/or salt if desired. 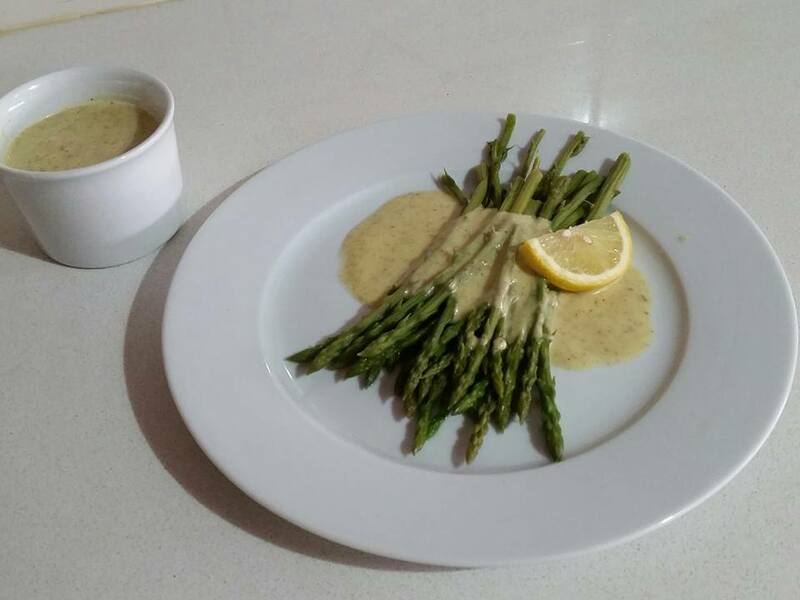 Do you ever make hollandaise sauce, vegan or not? What do you put in yours? What is your favorite way to serve it? Does this look like a recipe you'd try?